Hello and welcome back! It's time for another TGIF Challenge, this time featuring the emboss resist technique! There are so many ways to use this technique. After you heat emboss, you can watercolor, sponge or spray your ink over the image, which will resist the ink! I chose to watercolor over my heat embossed greetings. I stamped them in Versamark ink, and heat embossed them with clear powder onto Watercolor Paper. I wet the watercolor paper with plain water first, and then colored over it with each of the ink colors (Berry Burst, Soft Sky, Tangerine Tango and Lemon Lime Twist) using an Aqua Painter. After doing this, the greetings stay white! Hello, and welcome back! It's time for another Fancy Friday Blog Hop with my fancy friends (all current or former members of the Stampin' Up! Artisan Design Team). You'll love all of the wonderful ideas you see on this hop, so be sure to circle all the way around. We also have a Pinterest board that you can follow. 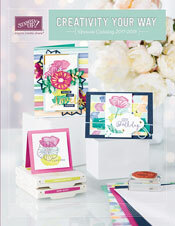 You might have just arrived from Sue's blog, and I'm sure you loved her fun cards! For this month's theme, we decided to show you several projects that you can make with the new Memories & More card packs and accessories. I'm using the Color Theory pack, which is focused on the seasons of the year. I decided to make a pocket page and also two cards to share. Hello and welcome back! It's time for another TGIF Challenge, and this week it's a sketch challenge. Hello and welcome back! It's July...how did that happen? That means it's time for another One Stamp At a Time Blog Hop, and our theme this month is Very Vintage. I have to say that vintage style is not my forte. I used to make more cards in this style, but most of the sets I used have retired! I did pull out a stamp set and dies that I hadn't used yet, so that's a bonus. I pulled out the Best Birds Stamp Set and the Birds & Blooms Thinlits Dies for my card and gift bag/tag today.